The push towards the end of the calendar year is the busiest quarter for many Americans. With the lazy days of summer a distant memory, work obligations seem doubled, family commitments pile on, and weeknights are chalk-full of soccer practices and parent/teacher meetings. Never mind the frantic holiday shopping season that always seems to catch us off guard, every year. This time of year, your average family is never on a consistent schedule, and that means your rush out the door and return home are never regular. Being able to reach for your smart phones and smart watches to queue up property lights is a very achievable luxury. A la remote garage door openers, once you introduce on-demand lighting to your home, you'll wonder how you lived without it. There are many residential-friendly products out there, one of our favorites being the Lutron lighting systems (which you can experience here). 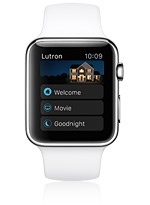 Lutron's products help large-home owners fully control lighting configurations from mobile devices. How often do you find yourself walking down a dark flight of stairs to the basement with your hands full, or stumbling halfway across an unlit living room to find a light switch? Not acceptable in the 21st century. Products like the Lutron RadioRA2 allow you to store personalized presets for multi-room lighting configurations to help simplify the small details of your daily routine. We've found their elloquent and intuitive smart watch apps to be a joy to use for toggling different settings. Here's another benefit an integrated lighting system can provide which you may not have thought of: security. Many understand the first level benefits of automated lighting, and home automation in general, and can see how it makes your home safer and more practical. However, Buttonwood can take your lighting system one step further. Take a situation no one ever hopes actually happens; it's 2am and the fire alarm goes off in your home. Every second counts in these situations, especially when you have a family to get out of the house and keep safe. One bad decision can have serious consequences. With the correct lighting system in place, your fire alarm, security system, and CO2/Carbon Monoxide alarm can all be integrated as part of your house's central lighting system. If any of these alarms go off, all lights in every room of your home turn on, aiding in a safe exit and providing extra visibility. Additionally, property lights can begin flashing distress signals to alert neighbors and attract attention from authorities. But on a lighter note, let's talk about vacation! Before you leave, a simple VACATION setting can be enabled to randomly turn lights on and off during the evening hours (in an energy-efficient way, of course), to emulate your normal household activity. We've seen this for years in commercial buildings, and now you can add it to your home. Sounds obvious, right? Your parents, or even grandparents, knew the benefits of analog light timers, helping to take your mind off the downstairs light that was left on while you're upstairs and tucked in. So if antiquated analog accessories and single-purpose lighting products improve your personal and economic efficiency, imagine the benefits of a total home lighting control solution. Many cutting-edge lighting solutions include occupancy sensors which takes the guess-work and programming out of the equation. Much like your child's high school classroom, installing motion sensors into your home pays for itself several times over in the long run. Another Buttonwood favorite, Leviton, offers a variety of occupancy and vacancy sensors in several forms (ceiling, wall-mount, wall-switch, outdoor) to fit your many needs. Even the most humble sensor will save you serious bucks on your energy bill without any manual programming or configuration. Be sure to check your definition of "lighting automation", as simple light dimmers are automation solutions. When compared to a standard on/off light switch, every dimmer saves 4-9% in electricity, even when maxed out at the highest level. Quite simply, the more you dim, the more you save. A standard light switch only saves electricity in the “off” position. Lutron dimmers and controls save energy 24-7. While many think of incandescent lights when thinking of dimming, but all lighting sources, including halogen, CFLs, and, LED bulbs, can be dimmed, alibet, they come with challenges. Take a halogen light source for example. When dimmed 35%, it reduces energy use by 28%. On average, dimming an incandescent or halogen lights will reduce energy use by about 20%. As simple as a dimmer is in relation to a total overhaul on your current lighting system, installing dimmers correctly is more than just swapping out the plastic rectangle on your wall. Your local installation professional is best suited to help identify the exactly what you need to *correctly* convert your home into a dim-friendly enviornment. Check out this Lutron infographic for more information. Lighting considerations make a big difference in the overall aesthetic of your home. With the holidays approaching, dinner parties and gatherings with friends and family are more frequent than any other time in the year. Vibrant and intimate lighting configurations are only a click away. The ability to augment the mood of the evening is a unique arrow in the modern homeowner's quiver. Orchestrating the vibe of your house party with simple (and distraction-free) control is an understated advantage. When expecting foot-traffic to and from your home, you're likely to give property lighting more attention than normal. Especially with the inclusion of seasonal outdoor lighting, your existing switches for outdoor lights may not be in the most convenient location. Maybe your outdoor light switches are near a door, but far from the kitchen, or in a hallway on the other side of the house from your living room. Whether it's to dress your home for holiday celebrations, or light a walkway for guests, rarely do you want to interrupt your current priorities to reach for an inconveniently placed light switch. When the late-night movie or cozy game night nears its end, a CLEANUP preset can be queued to bring full lighting to your room. Task-oriented configurations help improve your personal productivity, and gives you the ability to indirectly remind your guests it's time to go. Instead of sitting through twenty minutes of extended conversation, a few keystrokes on your smart phone can give the necessary hint without rudely interrupting conversation. Bartenders have been doing it for years, and it's time you have the same control in your home. Interested in enhancing your home lighting this holiday system? Give us a call for a free consultation. Buttonwood is Boston's leader in home lighting installation, and we can provide the best solution to improve your lifestyle.